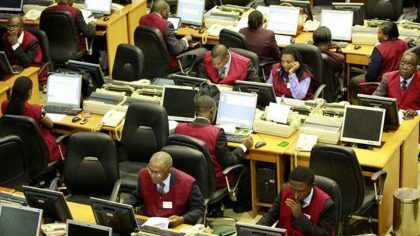 Transactions on the Nigerian Stock Exchange (NSE) opened on a positive note on Monday with crucial market indices appreciating following gains by large and medium-size stocks. The All-Share Index, within about six hours of trading on Monday, rose by 175.09 points or 0.45 percent to close at 38,844.32 compared with 38,669.23 achieved on Friday. Market capitalization increased by N64 billion or 0.46 percent to close at N14.071 trillion against N14.007 trillion recorded on Friday. Presco led the gainers’ table, gaining N3.35 to close at N73.70 per share. Nascon followed with a gain of N1.60 to close at N24, while Nigerian Breweries gained N1 to close at N118 per share. Flour Mills added 60k to close at N33, while Guaranty Trust Bank gained 45k to close at N41.60 per share. On the other hand, Lafarge Africa posted the highest price loss to lead the laggards’ table with a loss of 75k to close at N39.05 per share. Berger Paint trailed with 45k to close at N8.55, while Eterna Oil depreciated by 31k to N6.25 per share. BOC Gases declined by 22k to close at N4.21, while Ikeja Hotel lost 10k to close at N2.53 per share. The volume of shares traded closed higher with a growth of 187.18 percent. Consequently, investors bought and sold 603.17 million shares worth N3.89 billion transacted in 3,832 deals. This was in contrast with 210.03 million shares valued at N3.89 billion exchanged in 4,141 deals on Friday. A breakdown of the activity chart shows that Ikeja Hotel dominated trading activities with 279.64 million shares worth N704.99 million. United Capital Plc followed with an account of 79.128 million shares valued at N253.965 million, while Africa Prudential sold 56.77 million shares worth N242.91 million.